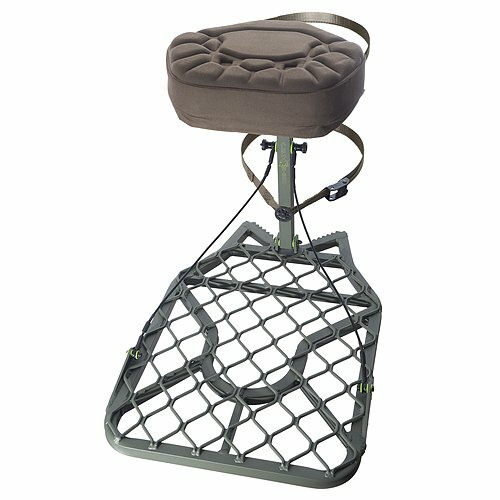 Hang-on tree stand that features a roomy 30in x 19.5in platform, extra thick contoured foam seat pad, convenient self-leveling system, offset bracket for increased side to side leveling on crooked trees, accepts the E-Z Hang Hook accessory, fits trees 4in-22in diameter, backpack straps and 6-pt Fall Arrest System included, TMA approved, 300-lb weight rating, stand weighs less than 14-lbs. If you have any questions about this product by Lone Wolf Treestands, contact us by completing and submitting the form below. If you are looking for a specif part number, please include it with your message.